-This morning, Lil and I visited a local greenhouse that grows leafy greens hydroponically. 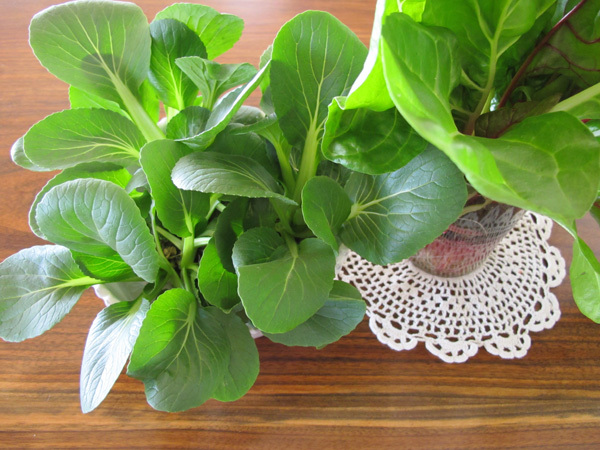 We picked up some baby bok choy and some swiss chard. When we got them home, they looked so pretty that I decided to replace the bouquet of Valentine’s roses that were in the middle of the table, with a bouquet of green yumminess. My ode to Spring. Can’t wait to get out there this year and grow stuff to eat!!! -Trying to organize my “workspace” for an upcoming book feature, and am having a heck of a time getting it to look halfway decent. It’s just so small. I love to look at everyone’s spaces, though, no matter how cluttered or small they may be, so I’m hoping everyone feels the same out there. -Trying to demystify the process of flocking. I adore these miniature animals & dioramas and would love to try my hand at making some. I think that in my future, I have plans to get really nerdy with dollhouses and miniatures. Just a warning. Yeah, spring!!! Can’t wait to see your upcoming projects!